I love fall for all the quintessentially fall activities: pumpkin picking, jack-o-lantern carving, scarecrow making, decorating, apple picking, and raking and playing in the leaves. This weekend I took the girls apple picking. There are several orchards in our general area, but we chose Eastmont Orchards. I like the wide variety of apples that they offer. 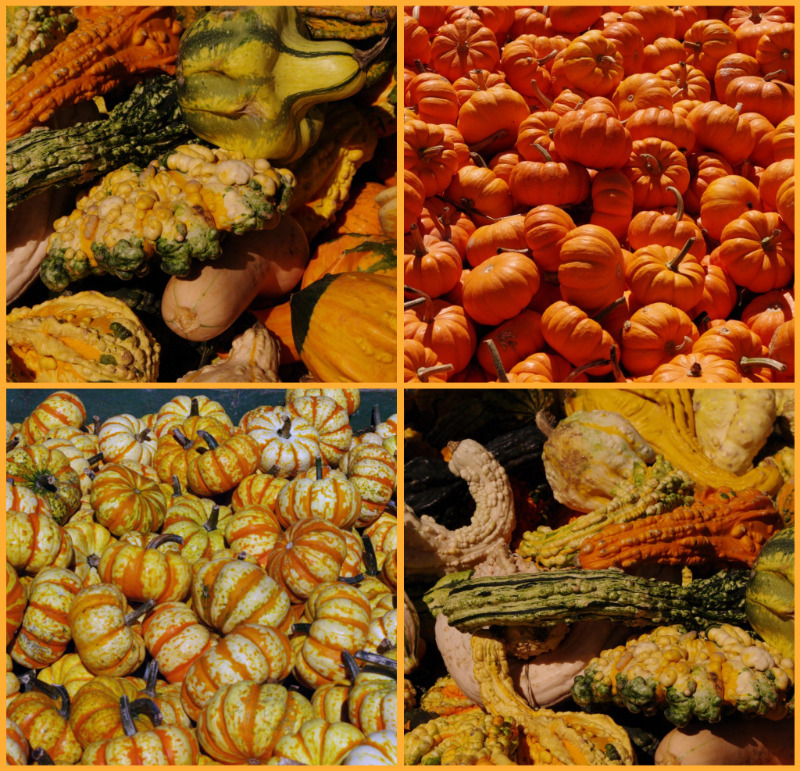 Plus, there is a pumpkin patch, and they sell gourds and a small selection of fresh produce too. On this particular visit, we focused on apple picking and gourds. We are saving our pumpkin picking for another day. Eastmont is enormous. There was row after row of apple trees. It is easily navigable, and there are maps available to assist you. Eastmont also provides plastic wheelbarrows and plastic bags. We took full advantage of the wheelbarrows, but we chose to bring our own reusable bags (just be sure to wash them afterwards). Emma brought a friend...because apparently at 8 years old, one must go everywhere with a friend. These are sunflowers that have been pulled from the stem. I've never seen anything like them. They were for sale for $3. There was a farmer who was showing everyone how they can be seeded as well as other uses for the sunflowers. We didn't buy one, but once we had gotten home, I wished we had. I am always a little resentful of autumn for pushing summer out of the way. But I do love the colors of fall. The earth tones mixed with the oranges, yellows, and greens are lovely. Plus, who can forget the pumpkin pie and red wine? This bowl is an enormous mixing bowl about 16 inches in diameter. Yes! We have that many apples! I love that this apple still has a leaf on it. We have lots and lots and lots of apples. I see apple crisp, apple crostada, and maybe some apple butter in my future. I'll be sure to share recipes and pictures. Although Eastmont Orchards had an abundance of apples and pumpkins, they did not have any yummy fall baked goods. But don't despair. Just down the road a bit is Delicious Orchards, famous for their pies, baked goods and their unbeatable selection of high-quality, fresh produce. I must warn you. Delicious Orchards is literally standing room only in the fall. Think mall at Christmas time. Yep. It's just that darn good. So, if you pull into the parking lot and are overwhelmed by the volume of cars, don't drive away. It is worth the trip. Some of my favorites include the apple cider, the apple cider donuts, the pumpkin pie tarts, the coconut cream tarts, and and the pepper crusted Brie cheese. So. Good. I do love the culinary delights of autumn. What do you love about autumn? Do you have special fall outings or traditions? Apparently you live in my neck of the woods because Eastmont Orchards is our favorite apple and pumpking place too! And no visit is complete without a visit to Delicious Orchards on the way home to pick up some apple cider donuts. I'm bummed because we've been so busy we haven't had a chance to get there and I'm not sure we will! What great pictures! It really looks like fall now! We have a garden full of white pumpkins which we didn't plant...they were surprises ...instead of the summer squash and zucchini plants we thought we had purchased...but they are so cute and will make great Halloween pumpkins! Fun! We did the same thing this past weekend - it was perfect weather for it!